We have a small apple tree on the office grounds full of golden-red apples. The apples are smaller than the one in the supermarket although with great flavour. 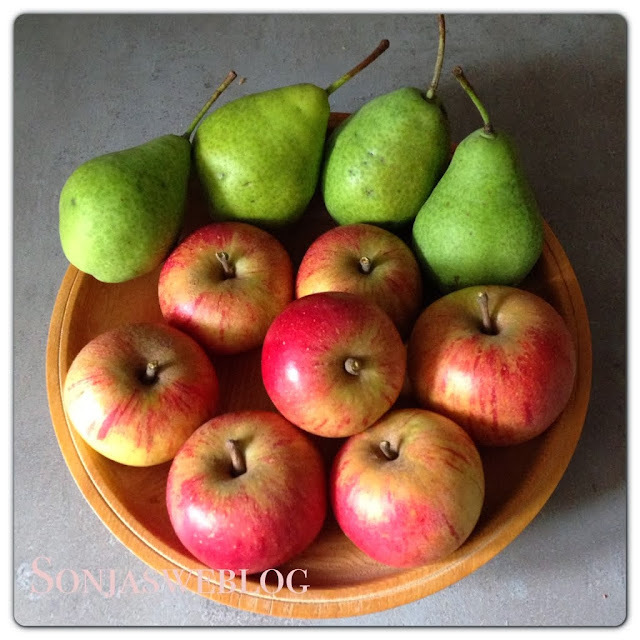 I picked some of them to make apple-pear puree (Unfortunatelay I cannot eat them raw due to an allergie. I always have to cook or bake them first.) You simply peel and cut the apples and pears and cook them in a pot with a little bit of water and lemon juice to prevent the apples to get a brownish colour. I also added some peeled and cut pears and some sugar. If you like add 3 -4 cloves and cinnamon. Cook until tender and make a puree using a blender. If you used cloves take them out before using the blender!!! (I usually wrap them into filter paper which makes it easier to get them out). My favourite dish with apple-pear puree is potato pancake. For the potato pancake grate potatoes, add some onions and flour and 1 - 2 eggs. Fry in a pan with oil until golden brown and crispy. Eat while still hot with apple-pear puree on top. Delicious!